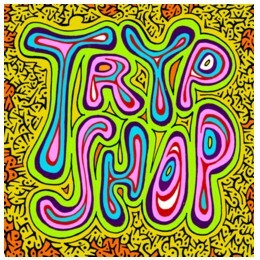 I already mentioned the podcast that Mark Vidler started doing recently, but I just listened to the third episode of Tryphop and I am so excited I that I wanted to mention it again. Check it out! It is one of the best music-podcasts I have ever heard. I while listening I made a logo, that I gave some colour with the software that came with our Canon scanner. It is very basic compared to Photoshop, but since I am no good with software, I like that. I can understand this Photostudio, as the software is called. It has only a few colours, basically just as much as I used to have when I used pencils. That is more than enough for what I want to do. Here is a song that could have been in Trypshop, but that happened to lay on my desk today. It is High by Jesse & James.